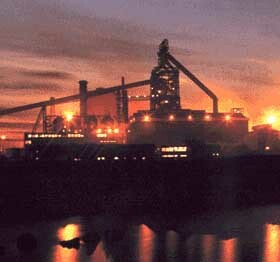 Blast furnaces are usually tall shaft-type steel vessels, up to ten stories high, internally lined with refractory brick, and superimposed over a crucible-like hearth. The necessary charge to produce molten pig iron consists of iron-bearing materials, coke, and flux. The charge is introduced into the furnace at the top. Blasts of heated air from large blast stoves, and in most cases gaseous, liquid, or powdered fuel, are injected into the furnace through openings (tuyeres) at the bottom of the shaft just above the hearth crucible. As the hot air encounters the coke, the coke is burned along with the injected fuels, producing the necessary heat and reducing gas to remove oxygen from the ore in the reduction process. As the iron melts, it descends and accumulates in the crucible. The molten pig iron and slag are drained from the crucible through different tapping holes. The gas that exits from the top of the furnace goes through a cleaning process. The cleaned hot gas is then used in other operations of the plant, e.g. to pre-heat the blast air, while the collected dust is sent to the sintering plant for recycling back into the blast furnace. Once fired-up, a blast furnace burns continuously until the lining needs replacement (approximately 5-6 years). Iron-bearing materials – The iron-bearing materials are usually iron ore, sinter, pellets, mill scale, steelmaking slag, scrap, and other materials. Coke – The coke is added to provide the main chemical reagents (carbon and carbon monoxide) for the iron ore reduction. Flux – The flux, limestone and/or dolomite, is added to combine with ash in the coke and gangue in the ores, to produce a slag that rises to the top of the pool of molten pig iron that collects in the crucible.